Excellent genuine pair of large Boji® Stones with certificate. Boji® Stones are always sold in pairs - one male stone and one female (only the very expensive Rainbow types are sold individualy). They are both textured stones but the male has extra raised geometric shapes on its surface. This type of stone can be found in many parts of the world (even in Kent in the UK!) 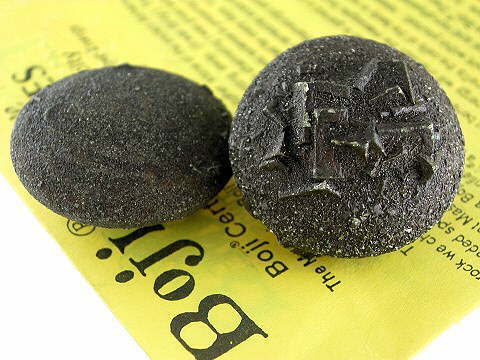 but to be considered real 'Boji® Stones' they must have come from one particular place - from the land surrounding a natural pyramid formation in south-west Kansas. The lady who owns this land, Karen Gillespie, has marketed them worldwide using the registered name 'Boji', (a name she gave these most unusual stones when she was a child) and all stones from this location come with a distinctive, yellow, embosed 'birth' certificate. If they don't come with the certificate they are NOT genuine Bojis. They are often referred to as 'alive' stones. This is due to a peculiarity with this type of stone. In their natural state, if handled often, they will eventually (and usually quite suddenly) spontaneously disintegrate and 'die'! Metaphysically this is thought to happen when the stone's energy has become completely depleted (the stones being held together purely by their living energy within). However some geologists say that this process is due to a reaction between the natural acids found on our skin and the chemical make-up of the stone. Science aside, to the layman this is a somewhat bizarre response from a stone - going from a Moh's hardness of 7.2 to mere dust! They have an obvious use; for balancing our masculine and feminine energies, our Yin and Yang - using the male on the left side of your body and the female on the right. But they are also extremely good for psychic protection. They resonate with the element of Fire and the planet Mars is their ruler. They have a golden energy which is very cleansing in nature and they also have a gentle magnetic energy. They are said to be able to remove pain from the body, by drawing it out, and can be used on accupressure or accupuncture points to help balance and clear blockages along the meridians.